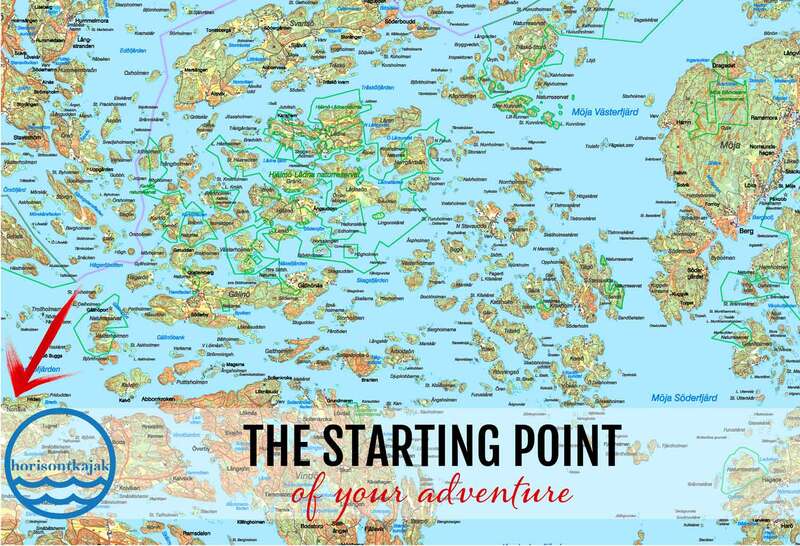 You’ll find us in the heart of the Stockholm Archipelago. Furthest out on Värmdö, only 40 minutes from Stockholm City. Just outside us, you can start your adventure among all the 24 000 islands in our beautiful Archipelago. It gives you shelter when you need it, as well as un broken horizons for those who prefer. Flat, soft rocks made for picnics and pitching your tent. Grass meadows are common for those who prefer the soft feeling of grass between the toes. The Archipelago Foundation owns or manages large areas for us to roam in. The archipelago has quite a few nature reserves and the environment deserves a bit of care. Please read about “The Public Right of Access” before you launch. 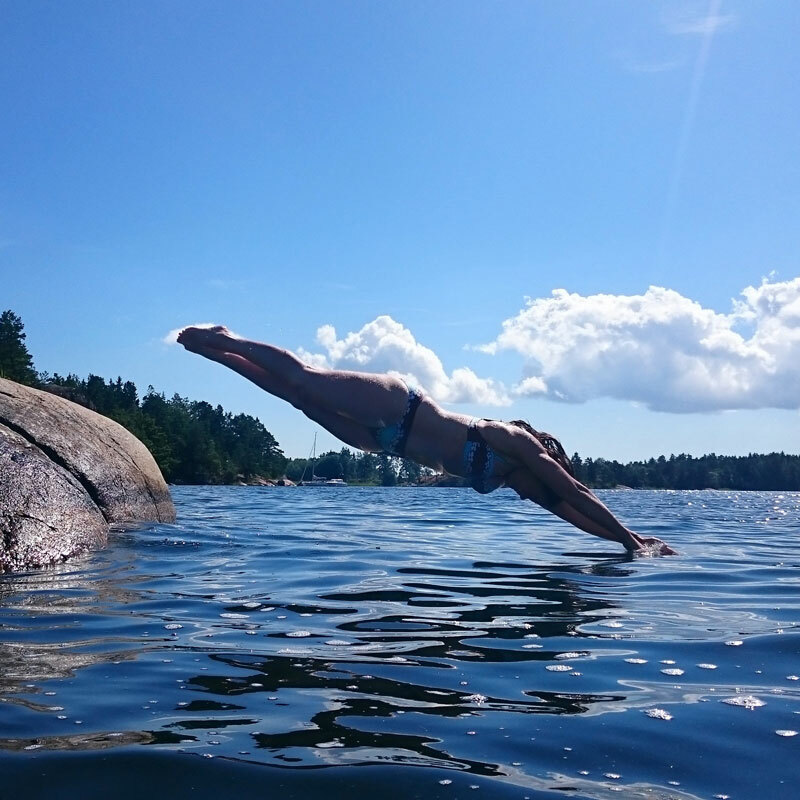 There are numerous options among the 24 000 islands in the Stockholm Archipelago. This is just a few inspirational suggestions. Even if we have spent more time than most people in this paradise, we still find new, beautiful spots. And even though we have travelled the globe, we still find this place amazing. 15 km from us, you’ll find the public sauna at Träskö Storö. 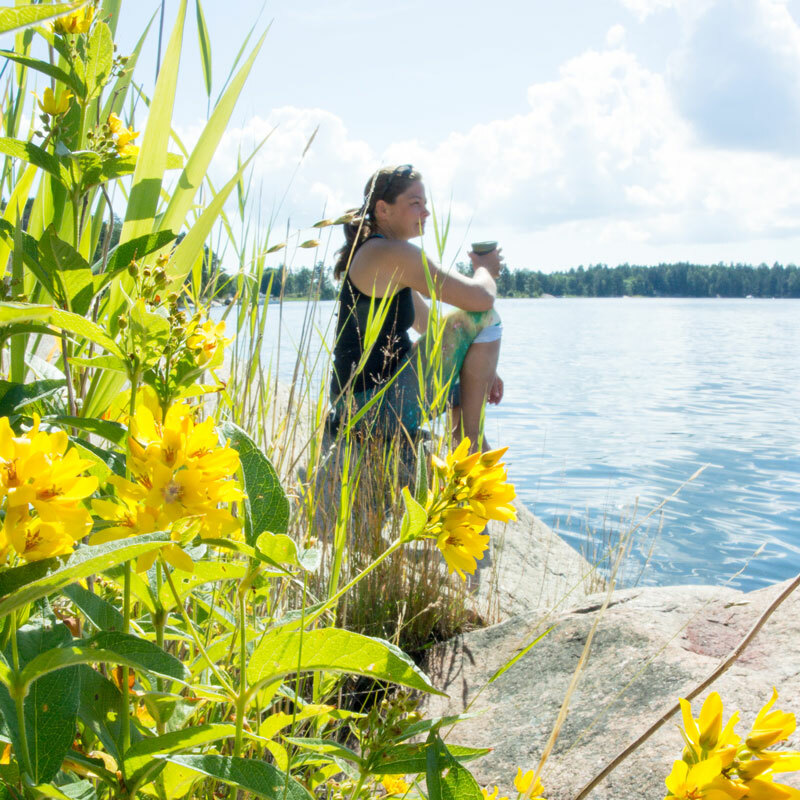 Sneak around the islands throughout the archipelago and make time for “fika” (the swedish word for coffee break). Most likely, ther will be cows or sheep joining you curiously. 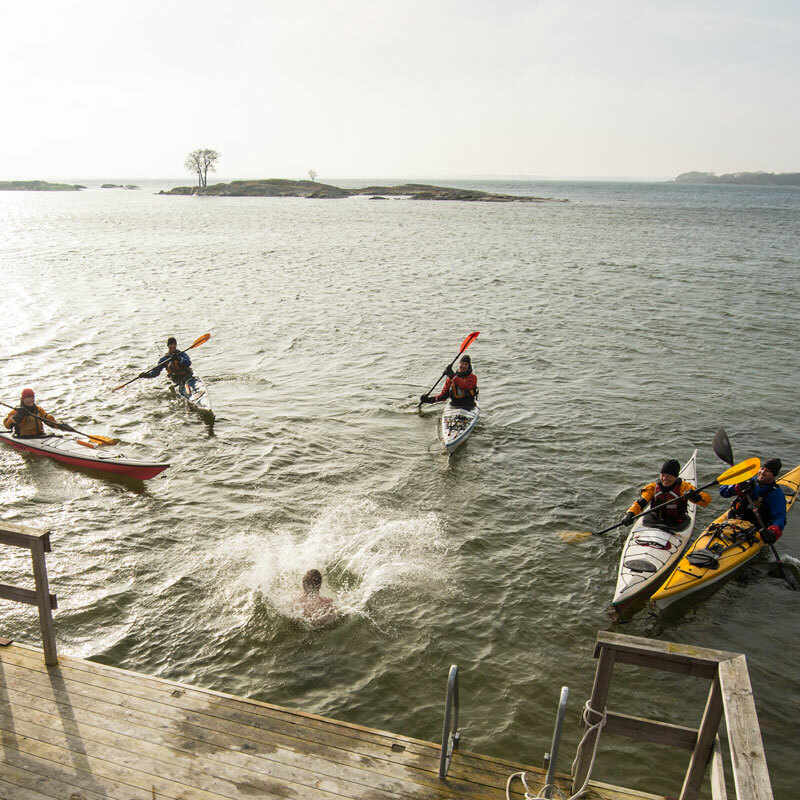 On the island’s western side, you’ll spot the public sauna, managed by the Archipelago Foundation. There is a small fee for using it, so make sure you bring some cash. It is definitely worth it. There is a large space behind the sauna for pitching your tent. For those who appreciate a nice view, pitch the tent on the hill on the right hand side of the sauna. We recommend an inflatable sleeping mat for that, though ;-). 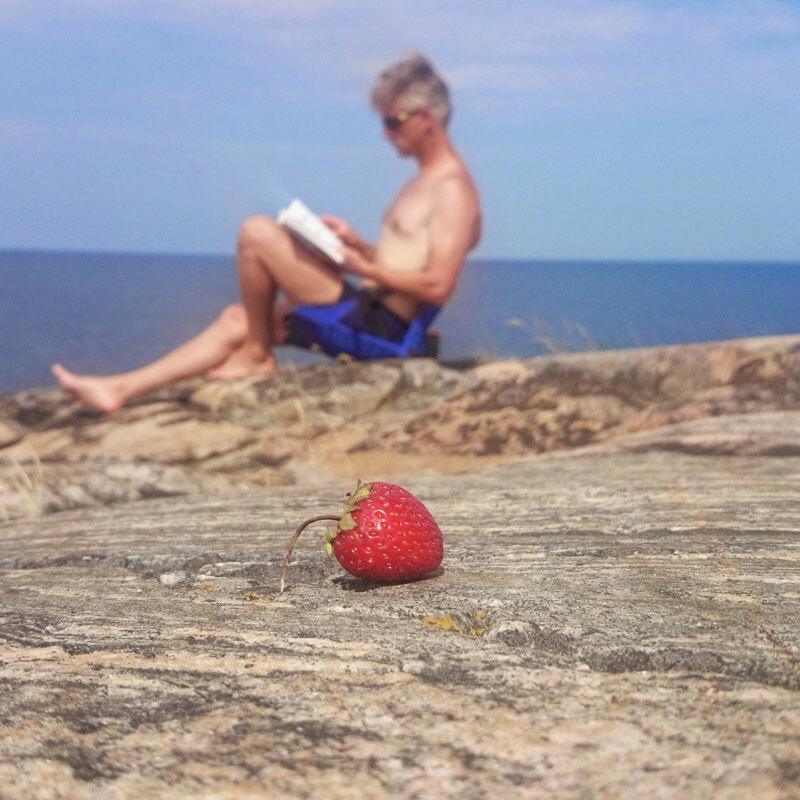 The Archipelago Foundation manages large areas in the Stockholm Archipelago for us to enjoy and as always in the outdoors, we are expected to Leave no Trace and behave according to The Public Right of Access. There is a permanent fire prohibit on the islands managed by the foundation. Vi gissar att du kommer tillbaka till Norråva med ett leende på läpparna. Välkommen. “The Horse’s Neck”. Only the name is worth going there. But there is more to explore on the way to the island that once housed a brick work. The major part is included in a Nature Reserve managed by the Archipelago Foundation. If you look closely, you can spot the remains of a farm from the 1900-th century. Don’t be surprised if you meet sheep or cows on the island. They do a great job keeping the island clean from young trees. No fires are allowed on the island in order to maintain the island for the person coming after you. The way to Hästnacken is possible to vary and you choose your own path. You can’t make it shorter than 10 km, though. 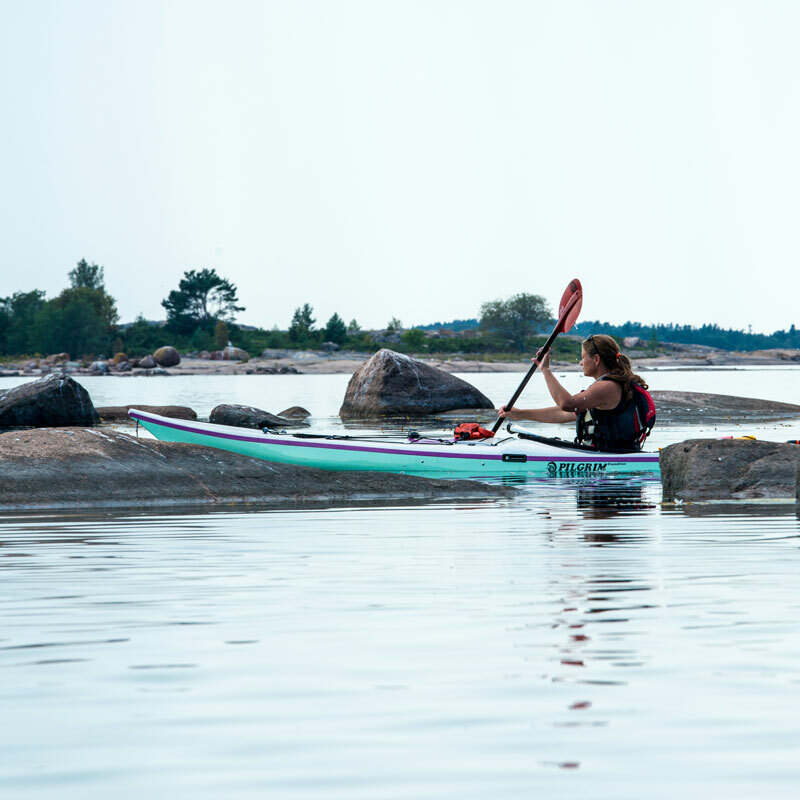 Just a few paddle strokes from Norråva, you’ll be able to go ashore on Stora Sandön. Sandy beaches and lots of room to pitch the tent. Ideal for a day trip with children or if you don’t have a lot of evening left when you launch from us on your first day. Bring your picnic and a good book, find your spot, go for a swim or two and watch all the beautiful sailing boats pass. Head out from Norråva pointing your bow east. Go north of Puttisholmen to avoid the shipping lane and continue with Klövholmen on your starboard side. Wind your way against Södra Stavsudda and do the crossing to Möja from it’s southern tip. Choose if you wish to pass Möja or visit the small community of Berg with it’s pittoresque church and make a pit stop at the store for an ice cream. Continue in between the winding water ways in the rest of the Möja Archipelago. At Kulans udde (headland) on Storö, there is an open hut for the public. Don’t miss the public sauna on Ostholmen. It is managed by the Archipelago Foundation and there is a small fee for using it. Make sure to bring cash. Take good care of it and Leave no Trace. No camp fires are allowed in the area. Distance Norråva – Kulans udde: about 25 km. Enjoy the 20 km to the northwestern part of Äpplare where you have a good view over Gälnan. Choose the straight route via Karklö or take a nice detour via Karklöfaret, Gubbholmen and the western part of Idholmen on the way to Svartsö. Svartsö transitions to Ingmarsö before you reach Äpplarö. Another 7 km to northeast, Hallonstenarna waits for you. A beautiful Nature Reserve with the sun setting when you turn your sun kissed nose west. If you choose to turn west instead, you won’t be disappointed when you reach Idskär. This suggested trip is aimed at the experienced paddler and it has lots of options, regard it more as inspiration than a fixed tour. You’ll have lots of possibilities to extend or shorten the itinerary.Make it a week, two weeks or five days, depending on your capacity and weather of course. Hallonstenarna is a good starting point for continuing to Svartlöga and Rödlöga before reaching Norrpada. 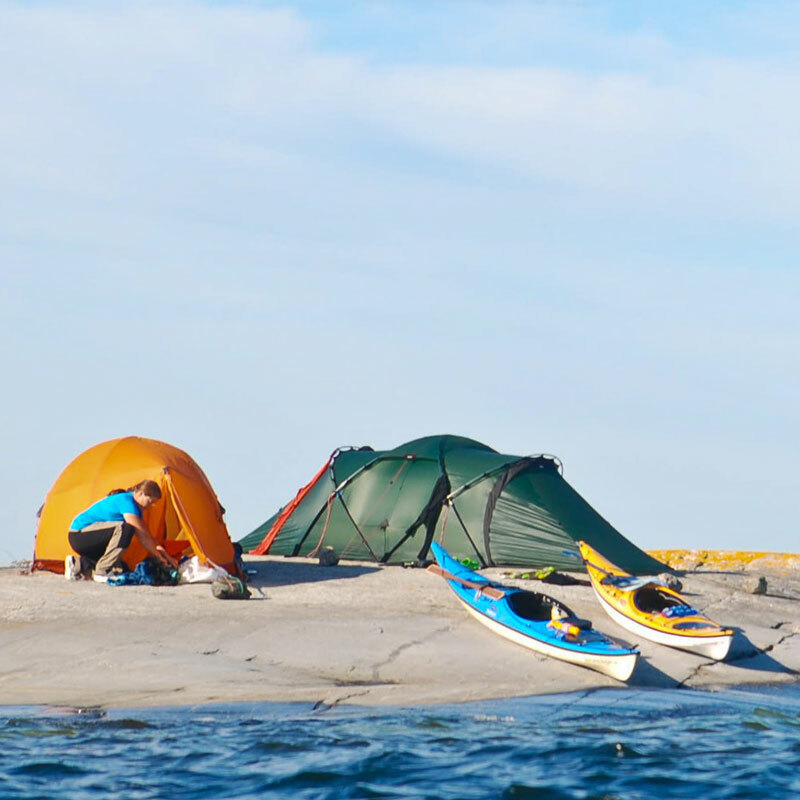 The archipelago gets more exposed so it takes a more experienced paddler to enjoy the scenery and the islands getting smaller and decorated with less trees, taken over by sloping, smooth rocks. The journey from Hallonstenarna to Norrpada is about 30 km or 16 NM. Of course, you have the option of dividing the stretch into two days and explore the islands thouroughly on your way. Svenska Högarna is the most easterly point in the Stockholm Archipelago. It brings you about 40 km or 20 NM of exposed paddling before you reach the outpost that has been written about as early as 1488. Monks travelled here to trade the the salted herring being prepared on site against pardon. There has also been a pilots on the island in the early days from the 18th century, but not any more. There is though a family living permanently on the island, working for the Swedish Environmental Protection Agency, The Archipelago Foundation and the Swedish Met Office.